It’s all fine and good to sign a climate treaty, but how do you know whether a country is keeping its word? Track it from space. Researchers have shown that observations by Earth-orbiting instruments can be used to estimate carbon dioxide (CO2) emissions from individual power plants. NASA’s Orbiting Carbon Observatory 2 (OCO-2; artist’s concept above), which was launched in July 2014, was designed to monitor the movement of CO2 in and out of ecosystems worldwide. 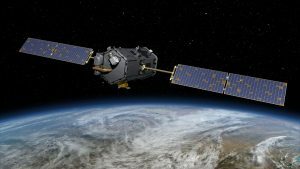 Despite the satellite’s generally broad focus, its sensors are able to measure CO2 concentrations in the air to within about 1 part per million in areas covering 3 square kilometers or less. When the team combined OCO-2 data from selected passes over certain power plants in the United States with computer models of how emissions plumes would disperse, its estimates of those plants’ emissions fell within 17% of the actual amounts those facilities reported for those days, the researchers report this week in Geophysical Research Letters. OCO-2, by itself, returns to view any particular spot on Earth only once every 16 days. But a handful of satellites circling Earth in low-Earth, geostationary, and highly elliptical orbits would likely provide the capability to monitor CO2emissions from mid- and large-sized power plants, the researchers say. Join our page for daily updates!